Listing of private crypto coins on decentralized Deex Exchange has already become a good tradition! DASH, Monero, Zcash with private addresses support – all these private coins are already on DEEX. Today the cryptocurrency market is in crisis. Down of many top assets has exceeded 90%. POW mining is unprofitable in many cases. Taking in mind that the main POW mining currency is based on GPU, Ethereum threatens to move to POS mining model, lot of expensive hardware is about to move to the echelon of 3D TIC-TAC-toe games. And now the Savior has come! Grin project that implements the Mimble Wimble protocol is the private POW mining coin. The name of the protocol which it operates on, came to blockchain from a series Harry Potter’ magic world (in the book it means the spell of tongue-tied, which binds the language of the victim, not allowing him to say a word). Security and anonymity of transactions made within the network is not just a good advertising move of Grin’s developers. The hidden history of transactions, showing only the way of creating the coins and a list of unspent transaction’s outputs (UXTO). Hidden transaction amounts are realized by multiplying the inputs and outputs by a random number (blinding factor, which is a private key). All inputs and outputs of different transactions within the same block are mixed and the block does not store the structure of transactions, so it is impossible to determine which output transmits the coin to which input. There are no addresses within the Grin network. Proof of ownership is carried out through the use of the public key of the recipient when you create the outputs of a transaction by the sender. All this allows to provide for the highest level of privacy, complete interchangeability of coins (fungibility) and the excellent scalability. The reward for mining this token is fixed and at the moment is 60 GRIN. The volume of emissions will grow linearly and infinitely. The average time for block creation is 1 minute. The transaction fee is based on the number of created/destroyed outputs and the total transaction size. The project doesn’t have any monetization model and doesn’t conduct the ICO’s. Development of the project is conducted on donations. DEEX is a universal decentralized ecosystem, so we are very close to the principles of the functioning of the Grin token and the technology of hidden transactions (stealth transaction), which will soon be implemented in DEEX project and will not be inferior to Mimble Wimble in terms of security and reliability. By the way, it will be much better in terms of usability. Many crypto enthusiasts around the world have already shown interest in Grin and a well-known Bitcointalk site in the near future plans to sell the statuses on the platform using this cryptocurrency – https://bitcointalk.org/index.php?topic=5098450.0. Instruction to replenish DEEX exchange account with GRIN through the console wallet. 1. Log in to your deex account and in the “Wallet” section get the address for the GRIN token. Each address will be unique! 2. Select the “Copy address” option. It will look like https://grinwallet.deex.exchange/my-dex-login, where «my-dex-login» is your login on the exchange. 3. In the GRIN console wallet enter the command for sending. 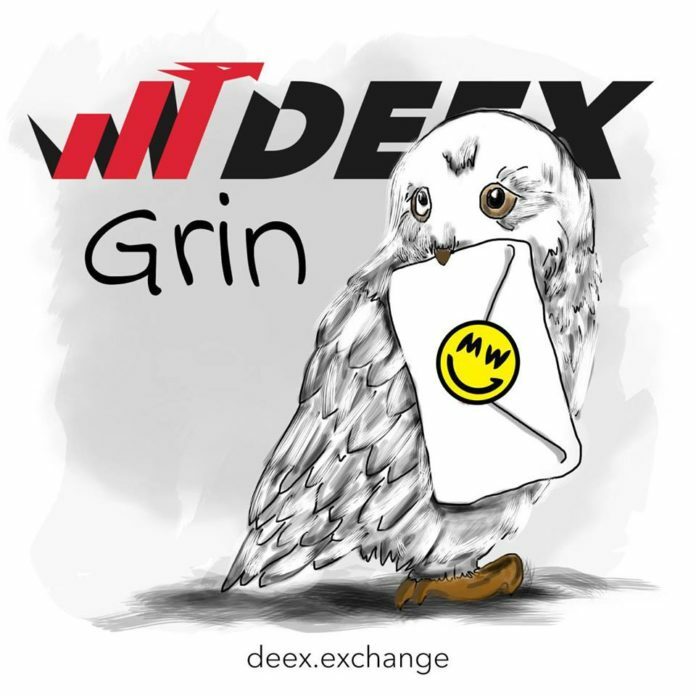 EXAMPLE: grin wallet send -d https://grinwallet.deex.exchange/my-dex-login 0.02 where “https://grinwallet.deex.exchange/my-dex-login” the address you copied on the Deposit page and 0.02 – the amount of transferring funds. Please note that the current transfer amount is limited to a maximum of 50 GRIN. The minimum amount is 0.02 GRIN. No additional parameters are needed. After sending, wait for confirmation of the transaction within the network, the funds are credited only after this step. The transfer can take from 1 minute to 6 hours. It’s a very promising coin! Let’s trade with GRIN on DEEX! Deex Exchange has become a sponsor of IEO meetup. 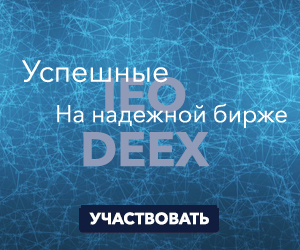 Welcome to Decentralized IEO with DEEX! © Deex Exchange 2019. All rights reserved.